How Do I Set Investment Goals? In setting your investment goals, your AGE is a very important factor. The age of an investor is usually positively correlated (moves in a positive or same direction) with the type of investments they will commit to. This means that as you get closer to your retirement, you will typically move away from investments that have a high degree of risk, require a large amount of capital (money) or have low liquidity (ability to convert the investment easily into cash). This is generally because you are approaching the later stage of your life and wish to spend the money that you have accumulated during it and not risk it for the purposes of accumulating more money. 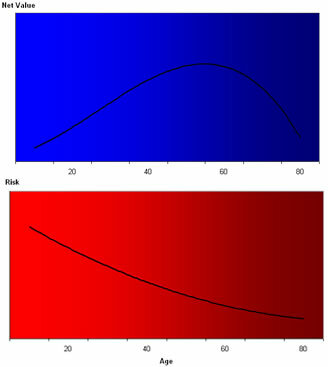 Conversely, if you are at a young age you have a longer investment horizon (time available to invest) available to you and therefore can choose to take higher levels of risk, provide more capital (money) for your investments and not be as concerned about the investment liquidity because you are able to continue to gain wealth, because of your age, even if your investment has not returned what you wanted it to. While these two different situations may not always be true, most people will not choose to adopt a lot of risk at an older age because they have spent the majority of their life earning money, and choose not to take unnecessary risks later in life that may lose them their earnings. Young people don’t have this concern as they have a longer time horizon in which to re-invest should an investment turn sour. Therefore, it is important to understand that this means that age is positively correlated to the amount of risk that will be adopted (see Understanding the Risks) and it is sensible to parallel this relationship to your own investment strategy. The correlation of age in comparison to risk, and age in comparison to net value (value of all your assets) can be modeled graphically. Your acceptance of risk is fairly high because you realize that you have a long investment horizon in which you can accumulate more assets. You should be learning solid investment advice to help increase your knowledge of investing. You are now well into your career and are paying off the majority of your long-term debt such as your mortgage and other associated debts. You no longer are willing to accept a high level of risk you earning capacity is decreasing as you get older. Your goal should be to retire wealthy. You now have the ability to spend your lifetime earnings and enjoy the remaining time of your life. Don’t stop investing – see investing after retirement. It is important to remember that this is just an established and widely accepted guideline but is by no means definitive or perfect. You may differ from this structure because of a hugely differing number of reasons that are specific to you and these should be discussed with your financial planner or adviser. The purpose of including them in this educational section is not to get you overly worried about their importance but to ensure you are conscious of the underlying purpose of these periods and the reasoning behind why they exist. Properly settings your investment goals will help you stay on track to retiring wealthy. Do you have any other investment goal setting advice? Leave a comment below to help others.